There are some items that you should simply never pay full price for. Not only can you find these items on sale frequently throughout the year, but it many cases you can negotiate a deal for them or find them at a cheaper price by comparison shopping. Whether you are buying a new mattress because your old one is so worn out that it is ready to walk off the platform by itself or you are simply looking for a new model that will give you a better night sleep, never pay full price — there are plenty of mattresses deals, even on name brands, that can be found. Pass any mattress store and you will likely see a big, red sale sign in the window — mattresses, which have at least a 70 percent mark-up price, are most always on sale and retail even cheaper on holiday sale days, including Black Friday, Memorial Days, Labor Day and President’s Day. Consumer Reports, for example, states in its Mattress Buying Guide that if you wait for a mattress sale, you can save at least 50 percent off the list price, but buyers should be cautious about pulling out their wallets right away because a deal on a mattress isn’t always what it seams. Consumer Reports points out that mattress manufacturers “modify innerspring mattresses for different sellers, changing the color, padding, quilting and pattern.” So, that mattress with a blue cover that you fell in love with may be cheaper at a different store — it just has a different name and that blue cover is white. 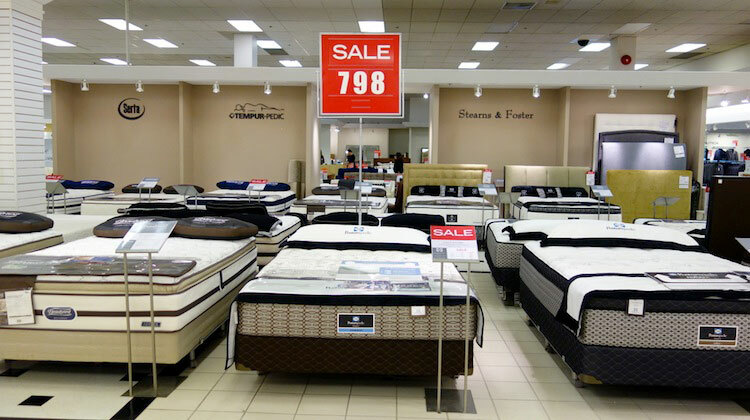 Mattress prices also have price tags that can be negotiated. Forbes listed it as one of five things that consumers can haggle for because mattress salespeople are paid on commission and given the authority to negotiate. And after your chew them down on a price for the mattress, ask for free delivery and removal of your old mattress. If you are looking for a high-end dishwasher, washing machine or dryer or one that will just get the job done, be sure to scour advertisements and the web for the best deal because they are at your fingertips. Appliances sales, like mattresses deals, can always be found on holidays, including Black Friday, President’s Day, Labor Day and Memorial Day. For example, a Maytag Centennial 7 cu. Ft. dryer on Black Friday 2013 was selling for $399 at Lowe’s and this month is selling at the same store for $100 more. The same is true of dishwashers. On Black Friday 2013, Sears offered a Kenmore Elite 24-inch, built-in, stainless steel dishwasher for $699. That same dishwasher in February 2014 is retailing for $899.00, a $200 difference. Since you’ll only be buying appliances once every few years (hopefully), you’re best off buying on a big sale day. The price of appliances can also be negotiated. After speaking with buyers, Consumer Reports found that 75 percent of those who haggled over a price of an appliance where able to talk the salesperson down, saving, on average, $100 for a major appliance and $50 on small appliances. Appliances are also items that often come with mail-in rebates. For example, Lowe’s lists current manufacturer rebates on its website, including a rebate for a GE oven for $1,000. They say that diamonds are a girl’s best friend, but in some cases, it is a designer bag that’s her real matchless sidekick. But, like diamonds, designer handbags are costly, retailing in the thousands of dollars, but it isn’t necessary to pay full price for that perfect, authentic clutch. A number of designers, including Michael Kors and Coach, stock outlet stores full of bags that can be purchased not only at a discount, but also at an even lower price when you present a coupon. The designers themselves also offer end-of season sales, slashing prices and bags can also be found for 20 percent off on websites, including Overstock.com. And if you are okay with buying a used designer bag, there are a number of high-end consignment shops that sell hardly-used designer bags at half the price. It doesn’t matter if you are in the market for a new couch, armchair, kitchen or dining room table, you can find it at a discounted price. The price you pay for your new furniture can be negotiated with salespeople and deals can be found on major holiday shopping days, as well as throughout the year. In fact, Consumer Reports indicates that the best time to buy indoor furniture is during February, a month that furniture retailers most often release new items and older items are marked down from, in some cases, a to 200 percent mark-up. Using a simple online search or a price comparison app, you will find that any furniture item can be found for a cheaper price. Take a Lazy Boy Acme Arcadia chocolate microfiber recliner armchair, for example, can be purchased for $210.27 at Amazon; $179 at Walmart or $223.99 at AMB furniture. Mattress sale image courtesy of Shutterstock.